John Deere announced it has expanded its specialty tractor lineup with the addition of the new 5090EL and 5125ML, and additional updates to the 5100ML and 5115ML Low-Profile Tractors – reaffirming its commitment to the specialty tractor market. The 5090EL features a low stance and is built on the rugged John Deere 5E 4-cylinder tractor platform. With an overall height of only 69 inches and 90 engine horsepower, it fits easily through small doors like those found in poultry houses or horse barns and has plenty of power to pull a variety of implements. A lowered ROPS hinge point and factory-installed horizontal side exhaust on the 5090EL help minimize tractor height. Depending on the application, the 5090EL can be equipped with either R4 industrial or R1 agricultural tires. "A John Deere PowrReverser™ Transmission lets operators change direction without clutching – making the 5090EL very user friendly and ideal for loader work. 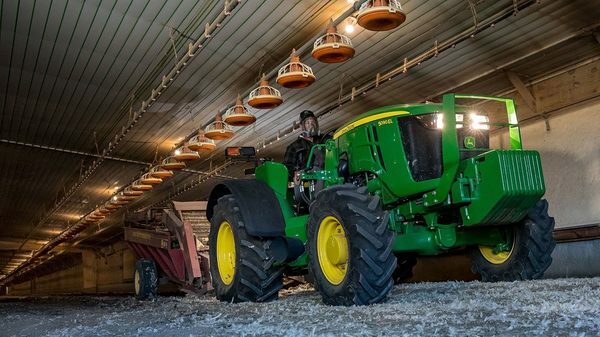 The built-in versatility these tractors offer make them a great choice to handle common hay and livestock jobs around the farm," said Justin Cherry, 5E product manager for John Deere. John Deere also strengthened its premium spec 5 Series low-profile tractor lineup by adding the new 5125ML and adding additional options to the 5100ML and 5115ML. "For tree-fruit or -nut growers, 5ML Low-Profile Tractors offer increased hitch-lift capacity and increased cooling capacity that rivals larger utility tractors," said John Doyle, 5M Tractor product manager for John Deere. "These improvements, combined with precise gear selection and ergonomically placed fender-mounted controls, provide an enhanced operator experience, increased productivity and industry-leading maneuverability." A John Deere PowerTech™ engine delivers 125 horsepower to easily handle heavy implements and workloads. "The 5125ML is equipped with a John Deere PowrQuad Transmission – previously available only on our larger tractors – so gear changes are push-button easy and require no clutching," said Doyle. The added options to the 5100ML and 5115ML feature three new transmissions compatible with open center hydraulics and electrohydraulic hitch. John Deere also added integrated technology to make the 5ML tractors smarter too. "Using JDLink™ telematics, owner/operators can now use their computer or mobile device to remotely locate their tractor to monitor engine hours, maintenance and fuel usage. This is a first for low-profile tractors," explained Doyle.